Sausage Balls are easy, cheesy and oh so delicious! These 3 ingredient sausage balls are a great addition to your party menu and are perfect served any time of year! Like Brown Sugar Bacon Wrapped Smokies, these can be made ahead of time, require very little prep and are always one of the first things to go! I love to entertain and we always have friends and family over for snacks and drinks. 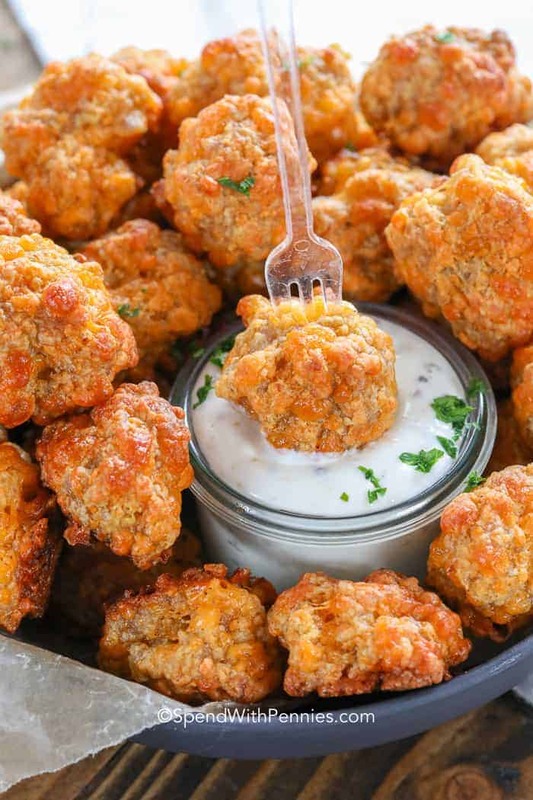 I prefer make ahead appetizers like Bacon Jalapeño Cheese Balls or our favorite Buffalo Chicken Dip. Making appies ahead of time means I can enjoy more time with my guests and less time rushing around the kitchen! 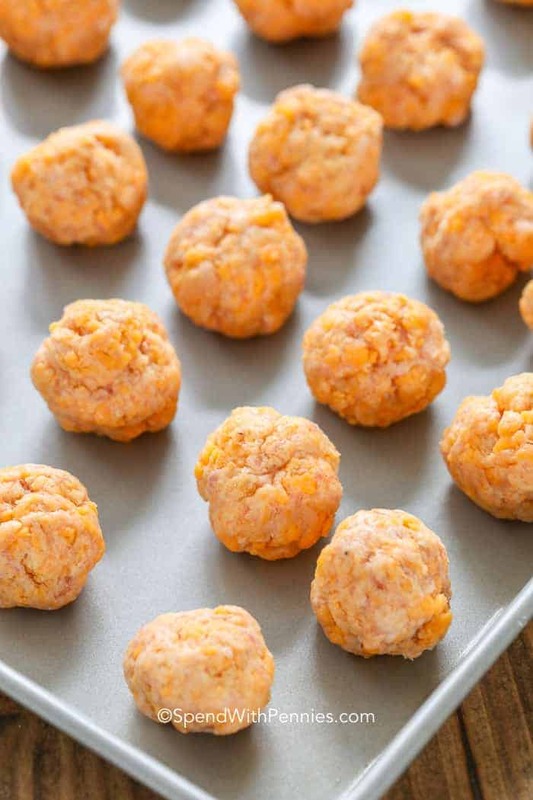 These easy sausage balls are the perfect tasty little morsels to add to your snack table. If you are looking for a great after school snack or a delicious treat for last minute guests, these Bisquick sausage balls will definitely hit the mark! 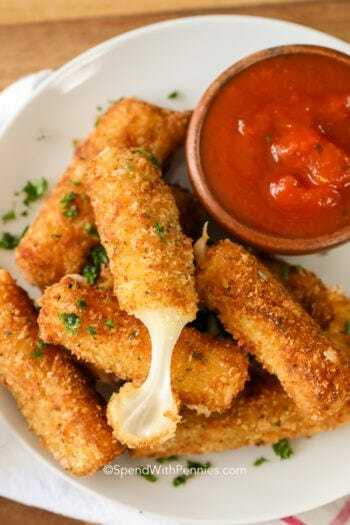 They’re crisp on the outside and tender on the inside with a cheesy goodness throughout. Having only 3 ingredients, these sausage balls insanely easy to prepare! Combine biscuit mix, sausage and shredded cheddar cheese. 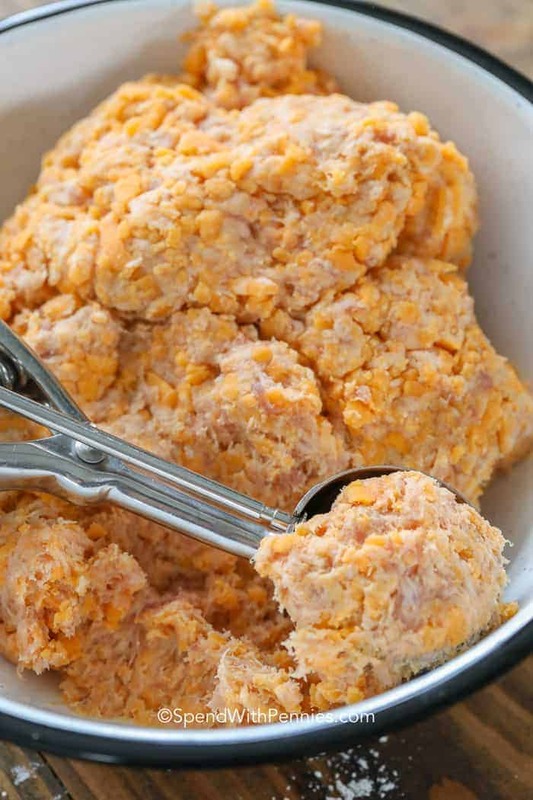 Yes, these sausage cheese balls can definitely be frozen. Place them on a baking sheet and freeze. Once frozen, transfer them into a freezer bag. They will stay fresh in your freezer for up to 6 months – if your family doesn’t sneak them up before then! If you are baking the sausage balls when they are freshly made, they will take about 20 minutes in a 350˚F oven. When baking from frozen, add an additional 8-10 minutes to the cook time (30 minutes total). 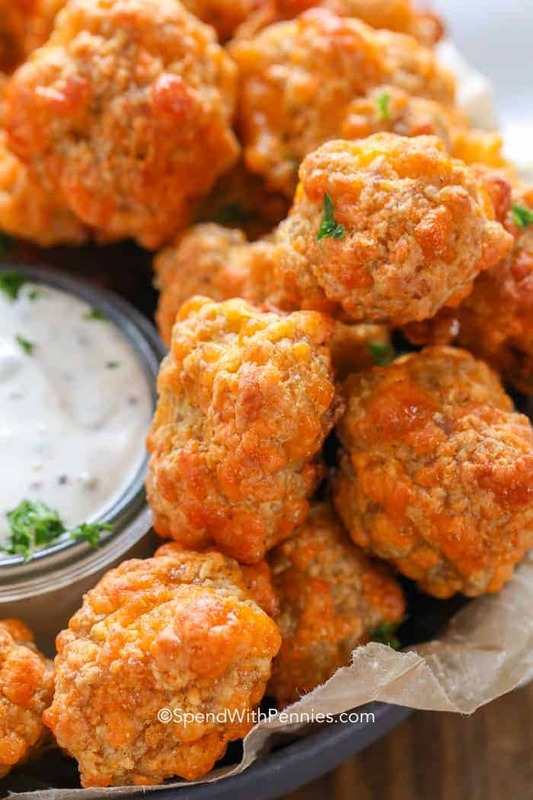 You can use any sauce you love from Spicy Dill Dip to as a dip for sausage balls. If you are in a time crunch, you can simply use store bought ranch dip or if you have the time you can try my Homemade Ranch Dip. 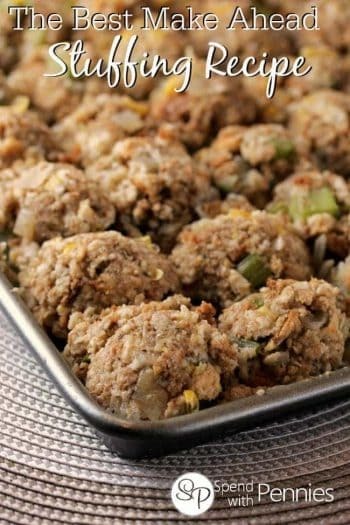 My absolute favorite dip for these Sausage Balls is found on the recipe card below. The grainy dijon mustard provides just the right amount of zing to compliment these tasty little appetizer balls! 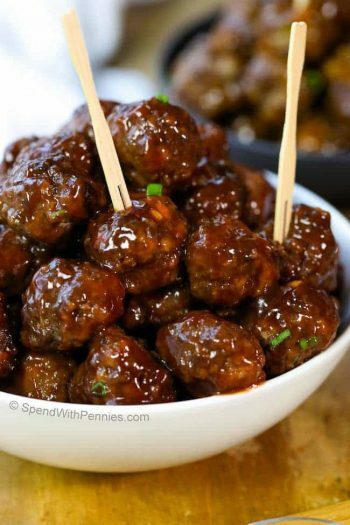 Easy Sausage Balls are perfect for every game day party or even as a holiday appetizer! 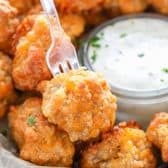 Tender and moist inside with a crispy and cheesy crust, these Sausage Balls will make you the “all star” of the party! 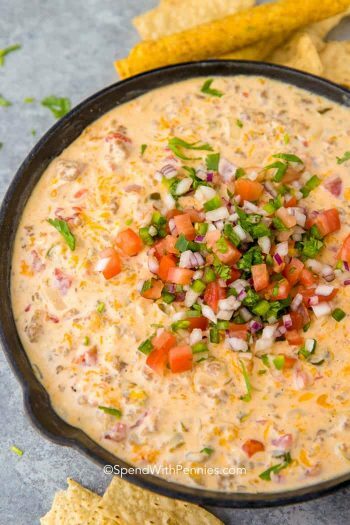 5 Minute Taco Dip – Easy! Crisp on the outside and tender in middle, these sausage balls need only 3 ingredients! Combine all dip ingredients in a small bowl. Refrigerate. Combine biscuit mix, cheese and ground sausage in a bowl. Mix thoroughly until mixture is moist and holds together. Using a 1 tablespoon scoop, form into balls. Place onto baking sheet and bake for 20-25 minutes until golden brown. Do you serve them warm, or cold, or does it not matter? I serve them warm, but I bet they would taste amazing room temperature! Biscuit mix, such as Bisquick, is a flour based mixutre that can be used to make various baked goods, including biscuits, pancakes and even crust for chicken pot pie. You can find a homemade bicuit mix here, and you can see biscuit mix by checking out these options on Amazon. Hope that helps Cheryl! Hi Holly, I’m from Australia. What is this ‘biscuit mix’ please? Biscuit mix, such as Bisquick, is a flour based mixutre that can be used to make various baked goods, including biscuits, pancakes and even crust for chicken pot pie. You can find a homemade bicuit mix here, and you can see biscuit mix by checking out these options on Amazon. Hope that helps Sarah! Hi Holly can I make these a day ahead and store them before cooking or do I need to freeze them? Thank you I enjoy your website and wonderful recipes! Happy holidays! One day in the fridge should be okay, any longer and I would freeze them. Enjoy! Did you use biscuit mix such as Bisquick and real cheddar cheese? Was your sausage raw? I’m checking to see if there’s an error in amount of bisquick and cheese. I have made these since the 70’s and use 2 cup bisquick and 12oz cheese to one pound sausage. The ratios in the recipe are the ratios I use. 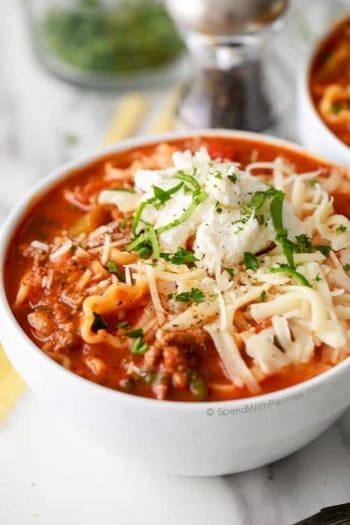 There are many variations of this recipe and it can certainly work well with different amounts. Hi! Do you serve these warm in a crock pot? I haven’t but it would work to keep them warm (if they were baked first). I just made these sausage balls and they are indeed very tasty and look exactly like the photos. The only thing I have to say is that there was nothing to bind the three ingredients together! There was no way I could have formed balls out of just the cheese, bisquick and sausage, so I added about 2/3 cup of milk. Was the sausage supposed to be cooked before it was mixed with the other two ingredients? The sausage should be raw. When you first start mixing the ingredients it’ll be a bit crumbly but once you work it a bit, it all comes together. I’ve added a video for your reference. Sounds amazing, but as someone that has to watch sodium, how many balls are a serving? The nutritional information is per sausage ball. Are you using a breakfast sausage like Bob Evans or Jimmy Dean, or Italian sausage? Just wondering because of the type of cheese you’re using. Cheddar/breakfast sausage or you could possibly do mozzarella/Italian sausage. Maybe a marinara sauce with the Italian version. Either way, I think it would be fantastic. Versatile for a brunch or a cocktail party. I’m always looking for new recipes like this one. Thank you! You could mix and match any type of sausage/cheese with this recipe! Sounds like a marinara sauce would also be tasty! Claire, this link will show you some biscuit mix. Hope that helps! It is usually called bisquick, or other brands, in box where flour is, these are delicious. Can these be frozen ahead of time? If so, do you freeze them before or after baking them? You can freeze them before baking. Enjoy! I first had these about 40 years ago. They were delicious then and delicious now. As an alternative to the ranch dip, try with a sweet chili sauce. Yum! I’ll have to try the sweet chili sauce for sure! 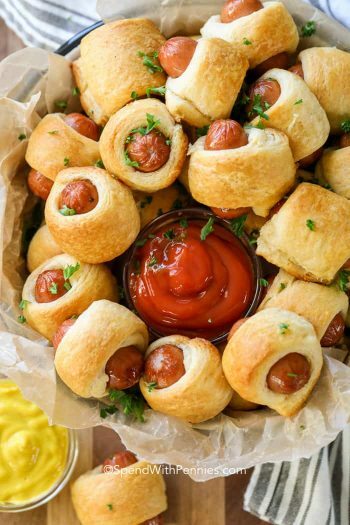 These look AMAZING, and I’ve brought a pound of sausage out of the freezer to try them. Have you tried browning them after baking either in a skillet or deep frying, for extra crispy goodness? The texture is more biscuit-like inside as the biscuit mix absorbs the juices from the sausage. I haven’t tried browning them, but do find the come out pretty crispy. Let us know how it goes if you try it!! They are great! Second time to serve them today. They seem to be crunchy to me. They came out a little “squishy” when I made them; hard to pick up with the fingers…even after an extra 10 minutes in the oven. So I did deep fry them. Which made them extra crisp and certainly solved the problem of them being too soft to handle. Glad you enjoyed them Erik!